VietNamNet Bridge - This morning, March 29, the Dragon Bridge over the Han River in Da Nang was inaugurated and opened for traffic on the occasion of Da Nang’s 38th anniversary of the liberation. Located 1km away, the sail-shaped Tran Thi Ly was also put into operation. 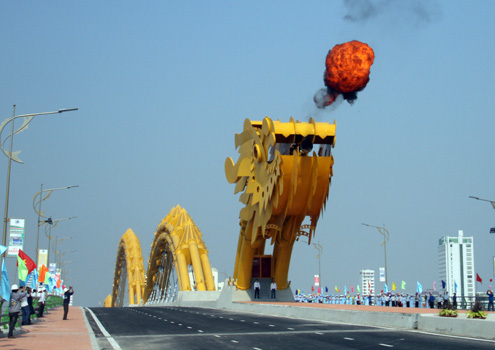 Deputy Prime Minister Nguyen Xuan Phuc, Minister of Transport Dinh La Thang, head of the Central Committee for Internal Affairs – former Chair and Party Secretary of Da Nang Nguyen Ba Thanh and Da Nang’s officials cut the ribbon to inaugurate the Dragon Bridge. Deputy Prime Minister Nguyen Xuan Phuc highly praised Da Nang’s synchronous development of infrastructure of Da Nang, especially the rise of the city's traffic system after 38 years of liberation. "This achievement is the result of the determination of Da Nang’s leaders and the consensus of the local people. The Government always supports Da Nang to become the center of economic, cultural, and economic development in the central and Central Highlands region as well as the country", the Deputy Prime Minister stressed. Being kicked off in July 2009, the Dragon Bridge has a total length of 666 meters and 37.5 meters in width, with six lanes. The total investment is more than VND1.7 trillion (around $85 million). The dragon simulates the shape of the dragon in the Ly Dynasty, which flies to the East Sea with steel spans totaling 568 meters in length and nearly 9,000 tons in weight. This is the architecturally unique bridge designed by the Louis Berger Group (USA). It is also the only the bridge with single steel arch design in Southeast Asia at present. 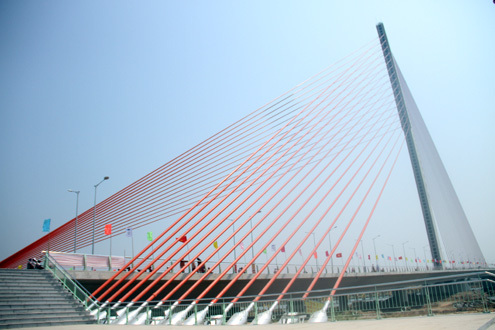 The same morning, Da Nang also inaugurated the Tran Thi Ly Bridge that is in the shape of a sail on the Han River. The construction of this work started in April 2010. It is 731 meters long, 34.5 meters wide, with a total investment of more than VND1.7 trillion. The two bridges are located on the two important transport axis of Da Nang city, connecting the downtown area with the two coastal districts of Son Tra and Ngu Hanh Son. They are considered the symbols of the coastal city. There are six bridges across the Han River, including: the Han River Bridge, Thuan Phuoc Bridge, Nguyen Van Troi Bridge, Tran Thi Ly Bridge, Dragon Bridge and Tien Son Bridge. Tran Thi Ly Bridge is located adjacent to Nguyen Van Troi Bridge and it is built to replace this old bridge.